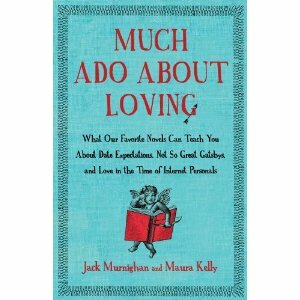 Read the introduction to Much Ado About Loving: What Our Favorite Novels Can Teach You About Date Expectations, Not-So-Great Gatsbys and Love in the Time of Internet Personals, out from Free Press on January 3, 2012, here. "David Foster Wallace may have been sympathetic to the just-published Much Ado About Loving in which the writers Jack Murnighan and Maura Kelly plumb great literature for relationship advice." "I'll take my advice from Toni Morrison over Suzanne Somers any day. ... That's more or less the premise from which Kelly and Murnighan operate in this oddly enjoyable read, with the authors teasing out lessons for contemporary romance from classical literature. ... The book is a clever mash-up of dating advice and literary discussion. ... Probably the first time Virgil has been used for romantic advice, at least in this century  and that alone is an achievement." "[The authors] have put together a terrific riff on dating, love and great novels ... It's surprising and impressive how well the authors' literary survey adapts to smart, accessible dating advice." Maura Kelly has been a staff writer for Glamour and a dating blogger for Marie Claire, where her column attracted hundreds of thousands of readers each month. Her personal essays and other writings have appeared in publications like the New York Times, the New York Observer, Salon, Slate, the Guardian, and Rolling Stone. Jack Murnighan has a Ph.D. in medieval and renaissance literature from Duke University. He is the deputy editor of Babble and the author of multiple books, including, most recently, Beowulf on the Beach: What to Love and What to Skip in Literature's 50 Greatest Hits.